Update 1: there are several other methods of streaming local media to Chromecast. The desktop sharing method illustrated below is mainly for turning your TV into your second screen of your PC. It is not good for video streaming (at least, for video streaming, there are some other better methods).You may check this guide: Comparison of 5 methods for streaming local media files to Chromecast. Almost every Chromecast owner knows you can cast any Chrome browser tab to your TV through Chromecast. What you need is just the Google Cast extension. You can even streaming local video, music or photos to the TV as I showed you in this guide: How to stream local video to Chromecast? But you may not know you can share the whole desktop to Chromecast, and watch it on the TV. Even better, the audio output can also be transferred to TV! When will you need desktop sharing to Chromecast? Sharing your desktop with Chromecast is not only for fun. It solves a lot of practical issues. If the local video format is not supported by Chrome browser, the guide of streaming local video to Chromecast is not valid, because Chrome will just try to save the video instead of playing it. Now, you can play it with your media player on the PC. The desktop screen will be mirrored to the TV and therefore you can enjoy it on the TV. Doing demos for a group of people may use a projector in office. But if you do it at home, TV screen is probably an ideal solution. You can easily share the whole desktop screen to Chromecast, and all people just watch the TV screen instead of poking heads around the monitor. Although we did not encounter any issues in sharing desktop screens with Chromecast, Google still mark this feature as experimental at the time of writing this guide. How to setup desktop screen sharing to Chromecast? In Chrome browser, click the Google Cast button, you will see the available Chormecasr devices in your network as shown below. You can click “Cast entire screen (experimental)” to start the desktop screen sharing. Of course, before sharing the desktop screen with the Chromecast device, there is a warning message letting you know that Google cast wants to share the screen and audio output (with Chromecast). You must click “Yes” to approve the screen sharing. At the same time, a notification of “Google cast is sharing your screen” will be shown on your desktop. Now, the the desktop screen and audio is shared to Chromecast. You should be able to enjoy the video or music on your TV. To stop desktop screen sharing with Chromecast, you can simply click “Stop sharing” in the notification, or click “Stop casting” in Google cast extension window. Do you have any problems or questions on sharing desktop screen with Chromecast? Use Chrome browser extension (Videostream) to stream local media files (video ans music) to Chromecast. Use Plex media server (and a free web app) to stream all media files (video, music and photos) to Chromecast. You may also check the this guide to find out methods of streaming local media files to Chromecast: Comparison of 5 methods for streaming local media files to Chromecast. The ‘Cast Entire Screen’ option is not working on my Win 7 64bit Dell Laptop. Though it is working fine on my Mac book. So that should mean that the router settings are alright, right? I’ve tried disabling the firewall and anti-virus and all other chrome extensions too. But nothing works. The single tab cast works just fine. Only problem is with casting the entire screen (experimental). Can anyone please help me with this..? Did you get any error message? Did you see the “capturing desktop” in Google cast extension (in Chrome browser) or “Google cast is sharing your screen” notification on the desktop? Nope. When I select ‘cast entire screen’ it just says UNABLE to do so. and suggests to try casting again or check network connection. By the way, if I log on my laptop in safe mode, the cast entire screen works. What could be the reason..? Did you try to change the desktop theme to Win 7 basic? Aero occasionally may cause some errors. Tried. Doesn’t work. CRAP. M frustrated now. Anyway, this is still an experimental feature. You can feedback to Google to help them improve the software. I got it working on my dell laptop with windows 7 pro 64 bit. Muy buenas, esto de pantalla completa, ¿se puede hacer con la table? I am using MAC Book Pro. I was able to cast desktop video to TV; but it did not include audio. First, as this is still an experimental feature. it may not work well. For the audio issue, you can try to toggle on/off audio only to see whether the audio can be streamed to Chromecast. MacBook Pro, streams the entire Screen, but no Audio. Tried to toggle Audio on/off, nothing will happen. Tried also VLC and iTunes as Players, doesnt matter. Audio seems only to be streamed, when played in Chrome. Yes, a lot of users experience similar issue when sharing the desktop. As I know, Google is working on this. No settings for this. It actually depends on the settings on your PC. For videos, it is better to use videostream extension, or just use Chrome browser. You should have audio issues. For video formats that are not supported by Chrome browser or videostream, you can try Plex. For music, you can just use Chrome browser. I had the same audio problem (Stream is muted). If I click on the cast button at the top of my browser, the left most button in the drop down is the sound control. Mine was muted there. Clicking that fixed my sound issue. Will Chromecast work with iMac running Mavericks that’s streaming TV shows, movies, etc from various sources (watchseries, for instance)? Casting the whole desktop is still an experimental feature. Some owners cannot make it work, or work partially (e.g.,no audio…). You probably have to try it on your own. Just came home with my chromecast and bought it only for the “cast entire screen feature” and it worked, but not great. I was however able to get it up in running in a matter of minutes. Running windows 8 I got audio and video but the mouse was extremely delayed and audio was of very poor quality, its functional but not efficient, for web browsing it would work fine but for my purposes (watching 1080p video) it does not suffice. Casting the whole screen is still experimental. It seems each firmware update actually improves a lot in this aspect. But anyway, Chromecast is still mainly a streaming device. it works best with some streaming service, including local streaming, for example, Plex. My suggestion is if you mainly watch videos in your PC, it is better to try Plex, It works very well with Chromecast. Casting full screen to play a VLC *.flv video requires that HW acceleration be disabled in VLC. Seems also the overlay screen is not casted to TV. Audio is not casted either. The result is quite bad, at best I had maybe 1 frame on TV when 4 had been played on my PC (windows). Better wait for some smart guy/organization to enable chromecasting directly from VLC, or Chrome to support .flv movie format. Thank you for sharing your experience. Casting the whole desktop is still experimental. I’m testing Plex on Windows pc, so far it is better than casting the desktop or Chrome tab. I tried this with my Win7 64bit OS and both monitors showed up on Chromecast (which is somewhat annoying though not unexpected) however the audio output was not being played on the remote device. I checked to ensure the audio was not muted on the Chromecast popup when selecting Desktop mode but it fine. The audio just didn’t play on the Chromecast no matter what source I tried. Similar issues were reported by some users. It seems the audio works for some, not for all. Hopefully, Google will sort this out when this feature is under beta (now it is only experimental). Actually, if you intend to use Chromecast for local videos or music on PC, Plex works nicely. It is free solution. I’m preparing a simple tutorial on this after finishing a few more testings. Is there any way to improve the aspect ratio of the mirrored screen? if my television was suited to 4:3 it would work a treat. Chromecast will not change the aspect ratio. However most TV has this option. If the source is not in the native resolution of radio is didn’t from the TV, in your TV settings, you may have some options. IT CASTS ONLY AUDIO AND A BLACK SCREEN! ??? 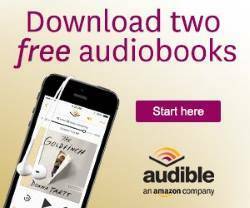 Did you happen to choose audio only? Most common problem actually is to get the audio. I keep hitting my “cast screen” option on my Nexus 7, and all it keeps saying is “casting screen to my chromecsst has failed” . please help ! This guide is for PC. It does not work for Android. How can you get the Google cast extension for Chrome browser on Nexus 7? The audio wasn’t working on my Win7 64bit desktop but it’s working fine with my Win7 64bit Samsung laptop. Unfortunately there’s a slight lag which would be annoying but acceptable for my Powerpoint slides but unfortunately video playback is very laggy and unacceptable at all transmission rates. It’s nice that this software/hardware works at all but the level of performance just isn’t there yet. I guess that’s to be expected of a beta product. For local media streaming to Chromecast (from pc), I will release a guide using Plex tomorrow. PLEASE TELL ME HOW TO GET SOUND TO THE TV! I CAN SEND VIDEO FROM MY MAC COMPUTER AND FROM MY GALAXY S5, BUT I CANNOT GET ANY SOUND. I HAVE A SAMSUNG SERIES 5 PLASMA TV THAT I SEND ALL THE SOUND (TV, DVD. CD) THROUGH AN ONKYO AV RECEIVER. I CAN’T FIGURE OUT HOW TO HEAR THE CHROMECAST CONTENT ON MY TV OR AV RECEIVER???? i figured it out. i had to go through the source tools in the tv to change the anynet setting to use the tv speakers for the sound for chromecast and mute or turn off the av receiver sound. How do you do that? I have video but no sound. Hi, I tried to cast the entire desktop and though I managed it, when I run a video file my TV only shows a black screen and has no sound while the rest of the desktop is shown perfectly. Even the subs (from a separate file) are shown but no image or sound. Any ideas? What is the video format? Flash may have problems. /both mp4 and avi files have the same effect. I forgot to mention that I am using windows XP but it is fully updated. Does Google cast use flash for video casting? very likely, it is related to graphic settings. Anyway, casting the whole desktop is still experimental. Please let me know if you still cannot find a workable solution or if you get any other issues. Casting Audio worked fine, but my tv only show a part of my desktop instead of the entire desktop (Upper left corner to 3/5 of the screen). Tried playing with the resolution of my computer screen, but it didn’t work. I don’t know what to do. (Laptop screen resolution is 1080p and running on windows 8). It could be related to some graphics settings. Hi Jonathan, were you able to resolve your issue with casting the desktop? I’m facing the exact same issue. I’m also using a laptop and Windows 8. Thanks. I am also having the same issue – on a Windows Surface 1 Pro Win 8.1. Only get about a quarter of the screen and can’t seem to adjust it. Not sure which setting to try to adjust, TV, PC, Chrome??? Chromecast itself doesn’t seem to have any setting in this realm. REALLY excited about getting this working, it would solve sooo many issues for me. Am an Client Facing PM, really want to be able to do Powerpoints and share Word Docs with my hotspot on client monitors, I run presentations of both my Surface and IPad, this would be huge. We have to wait because the feature is still experimental. Based on the info I have, Google is aware of the issue on some systems. Each update addresses a few of them. Yes, Chromecast works better with android because Google can adjust it. For presentation, Android tablet or Chrome book would be a solution. Chromecast will not work with hotshot. I am using Chromecast. While i cast video using my I phone with the You tube, it works fine. Because You tube has that casting symbol, While i tried to cast using Chrome browser on my Windows Vista Laptop, using App provided by Chrome cast , it plays but very very slow while casting, at the same time if i play the same video on my laptop without casting it works fine. Not sure what could be the reason, any solution,? or Suggestion, will really help. Probably the compute specs are not good enough. Stream a local video through Chromecast tab need substantial hardware resources on the pc. This is different from streaming from internet because they are using different technologies. In using the “Cast Entire Screen” option, my TV screen goes black and has a blue Chromecast icon in the middle of the screen. Cast this tab works fine, but, no luck on the entire screen. Any suggestions? Thank you. Very likely, it’s caused by some graphic settings, especially on Windows 8/8.1. Thank you, Simon. Actually, I am on 64-Bit Windows 7. It would not surprise me to learn that it is graphic setting-related. Any direction on which graphic settings to try / debug? I have tried a few things such as disconnecting my second monitor, but, have not yet twisted the cube in the right way to get Chromecast to cast the entire screen. if you are using Nvidia nview, you may try to change the settings to default. If you have multiple displays,you should set the display as duplicate, not extended. Anyway I’m not good at Windows staff. For me. if works without any special settings. Yes, it may work. This is the purpose of casting the whole desktop. Because this is still an experimental feature, it may not work as you expected sometimes, you’d better test it before showing to your customer. Start the music player, set Chromecast to broadcast the entire desktop, then set the Chrome tab to full screen. That should do it. While downloading the suggested stream, my windows give me message that by giving access to this app, it may use the firewall which can access the data from my computer .Is it really troublesome ?Can you please advise. There are no known problems on this. Hi, i just bought the chromecast device. my intention is to use it as a device to share the screen of my laptop in the TV. My question is: my internet connection is 4G and has a maximum daily capacity of 3.5GB. If i use chromecast to see my desktop in the TV (watching a file that is located in my hard drive) does it use up the 3.5GB? Am i downloading stuff or the WIFI is simply connecting stuff, bluetooth style? many thanks Frank. ps – Simon, i don’t know if you work for google or not, but, man, thanks for your help and patience handling this forum. Hi Frank, thank you for your encouragement. Just like you, I am just an ordinary Chromecast user. Sharing desktop is still experimental. Some owners reported some problems. If you just sharing local desktop screen (playing local files), it will use almost no data. But please note, Chromecast requires Internet connection (although it consumes very limited data) ; otherwise it may refuse to work. If desktop sharing is not working well, and you are mainly used it for local media files, you can try Plex media server. I already put up a guide on this site. Great. So I need a good connection (4G) but not a lot of data. Thanks a lot Simon. Much appreciated. Yes. But please note, you need a router (for your mobile data). Chromecast does not work with WiFi hotspot (from your phone). Purchased it today and got it to run full scree but it either freezes or the video is jumpy in full. If I make the video box smaller(say 30%) of the screen is is better but still not watchable. Any thoughts before I return it and go back to my video out cable from my laptop? Sharing whole desktop is still experimental. It also requires considerable hardware resources. thanks , worked for me , you have to download google cast beta , its different from google cast . Working great, althought with lag. Not good for videos or others, but great for watching pictures of vacation or the likes. Videos can be better handled by the Videostream extension or Plex media server. Even tab casting handles video better than desktop sharing. So basically my router settings are all correct, including firewall from this PC since I can enter on youtube.com and simply cast the video, but there’s something blocking the extension to find my TV… is there anything I could try? it is probably due to some settings in your PC. You may try to remove the extension, reboot, and add it again. I have a Casting session between my Mac Book Pro and my Sharp TV. No sound is coming through? Is this just a fix in a later version of Chromecast or can I fix it? Should have mentioned I am using a Cast Entire Screen and getting no audio. Because casting whole desktop is an experimental feature, some users encountered similar problems. There are no solutions yet. It’s related to the system settings (which developers haven’t figured out how to make it more robust) , as I heard. I am able to cast from my windows 8 laptop. However, I the audio on my laptop plays as well as it does on the tv. How do i get the laptop audio to stop playing and only play on tv. This happens on some systems. It’s due to some system settings. I don’t think there are any solutions yet. Please note this is still a beta feature. If you want to stream videos, other methods work better. How do you cast from a galaxy note 2 for eg to play a game and have it on the tv? Hola ami me gustaría hacer un pregunta con el goggle chromecast puedo reproducir una película desde el ordenador a la television y que el sonido se escuche por el pc? If you can play it in Chrome browser, you can cast the chrome tab. Casting the whole desktop is still experimental. And to clarify I’d like to cast a non-chrome application to the TV. Thanks again. Probably not. Currently desktop casting does not work well with extended display. Hi, I am facing a very interesting problem with my chromecast. I have got a Windows 8.1 laptop and if I try to cast the webpage through Chrome, it is showing me – device not found error whereas if I open youtube.com in the same window, I can cast it through youtube’s cast icon. Anybody faced the same problem? You may try to add Google cast (beta) extension to see whether it helps. Works awesomely for me! casts audio and the entire desktop smoothly on a Samsung 32″ via my laptop. Great device. Thanks a lot for this guide, it was extremely helpful! Hi there. I’m trying to cast my screen from y Windows 7 machine to my LG smart TV. It works, but on the TV screen the upper half of the screen stays on the desktop and flickers, while the bottom half shows the bottom of the window I have open. I’ve tried changing aspect ratios on the TV and projector options on he laptop. The only thing that gave me a stable image was the extend screen option on the laptop, but this gave me effectively two screens together at a quarter of the size of the TV. Any thoughts? Some users experience this or that problem with desktop sharing through Chromecast. It seems they are mainly caused by graphic/display settings in the pc. But there are no official guidelines from Google yet. For some pcs, you actually need turn off multiple display. Also, the settings in your TV, especially the scaling settings, may often affect this feature as well. Normally, it is not necessary to change the aspect ratio. of course, this depends on the individual TV. Thanks for the tips – I got Plex to work perfectly well on my Ubuntu 14.04 laptop. Everything working out of the box and now enjoying my fave TV Shows on my tele. Is the quality of the screen ‘mirroring’ good enough to play games? I read that this would be large? I want to replace my HDMI cable by the chromecast to mirror FIFA to my TV screen. If depends on so many factors. The best answer is to try it yourself. Sharing desktop may not work well for games. It’s still experimental. The display quality is scaled down up to 720p. If you can use HDMI cable, it will be surely better than any wireless display methods. Chromecast usually is used as an alternative when cable connection is not available or not convenient. My son purchased this for me so I could get rid of the SVGA cable between my PC and TV. The problem is my PC is not wireless, so I get the message to turn on wifi, which I can’t do. It is plugged in to the router which is wireless. Any way around this? Your PC can connect to the the router through cable. There should be no issues as long as both the PC and Chromecast are connected to the same router. (of course, Chromecast can only connect through wireless). Once PC is connected to the router, you can start the setup procedure). I’m trying to play VLC files through Chromecast.. I got my screen to show up and successfully play my VLC file on my tv, however, my audio is still playing from my laptop. Any ideas on how to fix this problem? You may try to use videostream extension to or directly play the video in chrome browser and then cast the tab. If you have a lot of videos, you may consider plex media server. Sharing desktop works well for images or presentations. For videos, a lot of users reported the similar audio issues. There are no solutions because this feature is still experimental. Of course, the issue is related to some system settings. You can try VLC for Android app. It finally supports Chromecast. You may refer to this guide. Is it possible to stream it to 2 different television from a single laptop? I’m trying to set up a quiz trivial. I want to display what’s on my laptop to 2 different television wirelessly. Like can I put one Chromecast in t.v. and another chromecast in another t.v., can both of them connect to my laptop display same time? And if I want to display 3 t.v. do I just add another chromecast to the t.v.? Probably not. I think almost all apps and the Google cast extension currently cannot handle two chromecast devices simulateously. You probably need more laptops or mobile devices. video is played from my laptop desktop but my audio is not working on tv…. Desktop sharing is good for presentation. Some users have audio problems. This is still an experimental feature. I have multiple screens. Is it possible to just cast only one monitor and not my other monitors using the Cast Entire Screen option? There are probably no options for this yet. Actually, this is an experimental feature, and some users reported problems with multiple screens. I have a 2 part question: I purchased the Chrome Cast for the sole purpose of streaming TV show/movies from my laptop to my TV w/o having to use my HDMI cord. I followed the instructions for set up and it said ready to cast, but the TV show, movie, Net Flix app etc does not show up on my TV screen. It only shows in my laptop. Also, I was under the impression that I would also be able to watch TV on the apps available through Chrome cast without even using my laptop as a streaming device, but nothing shows on my TV screen but the initial Chrome cast set up complete screen . What am I doing wrong? Chromecast probably is not the ideal solution for you. For your case, an HDMI cable is till the best solution. However, you should have no issues with Netflix. You can always check with Netflix support. Chromecast can also mirror local screens through chrome tab casting or desktop sharing. This is for TV shows that have no Chromecast support. This is NOT as reliable (especially for the players used by different service providers ) as internet streaming due to different technology. If you have a supported Android device (see this guide: https://allaboutchromecast.com/screen-mirroring-with-chromecast/) , Android screen mirroring actually works better. Anyway, if you main usage is for watching internet TV shows (without official Chromecast support) from a PC, Chromecast is not a good solution. To enjoy videos, I would recommend videostream extension or plex media server. For desktop sharing, the audio issue is reported by some users, mainly mac users. There is no solutions yet. For tab casting, if you lose audio after casting, you may try to log out or reboot the machine. I am having an issue with the audio only coming through my mac when I share screens with Chromecast. Is there a fix for this? Some users experienced similar issues on audio. Google is aware of this problem, but there is no solution yet. The main purpose of screen sharing is for presentation, not for media. Anyway, Google still marks this feature as experimental. For videos or audios, you may try play directly in Chrome browser, then cast the tab..
A better and also simple solution is Videostream extension. Any errors did you get? Btw, Google never advertise the desktop sharing feature (It’s still in experimental, even not beta). The main intended usage of Chromecast is still internet media streaming. I am getting no audio at all! I am running the Chromecast (Beta) on my MacBook (10.7.5)- I have tried all three options: “Cast this tab” “Cast this tab (optimized for audio) and for fun “Cast entire screen (experimental). I have also attempted to disable and uninstall the chrome extension several times with no results. I tried using my iphone’s Netflix app to cast to my TV (knowing this worked yesterday afternoon perfectly) and today I had no audio at all. I have looked at the audio settling for my Hannspree TV and all is normal (as it was the last time I was able to cast WITH audio). I am at a lose as to what to do- Help!!!! For the browser extension, you can also install the official one (without beta, i.e.. Google cast). You may also uninstall Chrome browser, then install again. For casting issue with iPhone, you probably can try to reboot the phone. At the same time, you can try to unplug the power for Chromecast, after 1 or 2 mins, plug again. It’s funny when I look in the store it says I downloaded the original chrome cast. 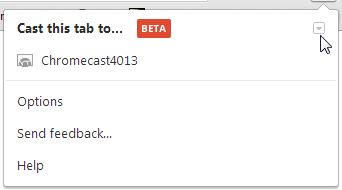 Yet in my Chrome browser extension menu it clearly says “Chrome cast (Beta)”. Seems to be working after I disabled and enabled it. I have multiple monitors setup, Is there a way to cast just 1 screen? Probably not yet. There are not such controls yet. Also, this is still an experimental feature. Some users are still facing problems with single desktop. I guess the development focus probably is still on normal single desktop setup. Works perfect – this is the most useful thing Google has ever invented! Hi I am using 64 bit windows 7 and the screen mirrors using the experimental desktop screen sharing but there is no audio any ideas? Some users experienced similar issues. There are no universal solutions yet. It can be due to your TV settings. You need set the scaling properly, especially when the aspect ratio is not identical to that of the TV. Of course, desktop sharing is still in experimental. Some users may experience some issues here and there. Thanks for replying Simon, I had looked through that link before posting the message but I am trying to stream through my media player to then stream it through my chromecast but with no sound. Hope they create a solution soon as it is frustrating!! For videos, you should try videostream or plex media sever. Desktop mirroring is really not good for videos at this time. I believe Google is aware of the issues. But due to the variety of the hardware, they haven’t figured out a universal solution. Hi Simon, thank-you so much for all this information. Thanks to you mine is working great. I have one question – is there any way to have video (plus audio) STILL PLAYING on my laptop WHILE casting? Similar to previous lady I am looking for 2 screens, both with audio, but unlike her one of those screens is my original desktop screen on my computer not a second chromecast. Currently I have both screens but only audio on the chromecast. Does it work if you just cast a cast a tab of Chrome browser? What’s shown on the TV? Got it working. I double clicked on the device name and away it went. I have been trying to use get Netflix in 5.1 to my AV sound system but with no success so far. Netflix seems to offer 5.1 ony out of their Windows 8 app, and when I use ‘cast my desktop’ feature from Chromecast the sounds is still stereo, not 5.1. Do you know anything I can try? It depends on several factors to get 5.1 sound streaming. First your receiver must support the receiver has to support Dolby Digital plus, not just DD. The pass through on the receiver may affect the audio. Try to insert Chromecast on the AVR or on TV directly. You should always turn on AVR before powering on Chromecast. When casting shows from the internet to Chromecast I find it is very slow and choppy. I’m talking about things like streaming sports, or shows from comedy network watchseries etc. rather than cast a tab, or mirror whole screen, Is there an app that works better for this? Or, is there a way to make the picture better? I’ve tried decreasing the quality in options, and that helps, but is still not ideal. Hoping there might be another solution. How did you stream to Chromecast? If the website/content provider does not support Chromecast, the quality will not be good. Chromecast is best for websites that supports Chromecast (Netflix, YoutuBe, Hulu…..) In other words, it works best when the contents are streamed to Chroemcast directly, not through PC or mobile devices (which can be used to initiate/control the streaming). Desktop sharing and tab casting are mainly used for casting static websites or local contents. so then there is no way to make third party websites video quality better? or decrease the chop? I was hoping there might be an app… or something. I was really hoping to just stream everything from the internet direct to the tv (like having a laptop connected via HDMI), but it looks like we are not there yet. Chromecast is not designed for such usage. If the website can choose to implement the code, they will work with chromecast nicely. They can also develop a dedicated app with chromecast support. Some website are reluctant to support chromecast due to considerations of ad revenue from website. From your side, you can do very little. Could you advise about the casting quality if I use this method to cast local audio music (like .mp3; .flac) to the TV ? The audio quality is limited by the sound card on the PC and music file. You may test music files with different quality. I want to extend my laptop screen besides from mirroring.. Is it possible? When I select the Option to Cast my desktop, it doesn’t give me an cast screen sharing request. I’m using a 2011 Macbook. Any thoughts? You may try the Google cast (beta). (you can have the both Google cast and Google cast beta for your Chrome browser). I have 2 monitors and it shares both monitors when casting which causes everything to be squished onto my TV making the picture distorted. How do I make it only cast one monitor? There is no such an option yet, as I know. would this work as a streaming solution for pc games ? I don’t think so. The lag usually is not acceptable. Some users may also have audio issues. An HDMI cable works far better. It works fine on my Ubuntu linux laptop, allthough no sound when I cast the whole screen. I use Chrome v 39.0.2171.99 (64-bit) on a Chrubuntu Acer C720P. Only one tab does cast the sound. Any idea why sound wouldn´t cast with the whole screen? Desktop sharing is still experimental. Chrome tab casting is a formal feature. For the Chromebook (not running Linux) , you should have no issues. When I go to cast to the TV all i get is audio and a green screen. The video is playing on the desktop google browser. Everything is setup correctly, according to your instructions. What am I doing wrong. I am using a MAC OSX and the latest google browser with the extensions.???? If the video is playing in Chrome browser, you should cast the tab, not sharing the desktop. If you are playing video from internet streaming providers, the video may be not shown on TV properly if the service provider doesn’t support Chromecast. Thanks. I am on a Macbook Air, IOS 10.10.2. Chromecast uptodate. I want to cast only the video (and not the audio) to the chromecast since I want to bluetooth the audio to a stereo (separate from TV). I selected “cast to screen/window experimental) but most of the time (4 out of 5) it fails and I get a device error. If I cast the default i.e. tab or the video and audio it works everytime. No device problem. Thanks for any guidance. sorry to clarify, the cast to screen when it does work is not satisfactory because the image quality is far inferior to the default casting settings i.e. the 1st options in the dropdown under the casting options. Thanks. Mac has the most problems for desktop sharing. No universal solutions yet. Casting a Chrome tab is more consistent. – Saved/Local files, especially videos, are best using videostreaming. I’m on a MacBook Pro. Like most, casting my desktop is not including sound / audio. I need that, however, so I could stream the command line music I’m streaming (via Terminal). In other words, I need the Mac’s system audio output to play on my TV via Chromecast. I hope, at least, this helps those who land here as a result of a Google search … as I did. I have Chromecast working fine with my Android tablet. I want to be able to stream from my desktop. I have a full sized desktop computer with ethernet connection to my router. I downloaded the ChromeCast app. As it installed I get an error message that my WiFi is turned off and must be turned on. I don’t have WiFi on my desktop. Is that necessary for this app to work? You should NOT set up again. You should download Google cast extension then use it straightway. Wifi is needed for setup only. Add you already set the Chromecast up from tablet, it’s not necessary to do any setup on the pc of the pc is connected to the same router. You only need chrome browser and Google cast extension on the pc. I have a dell OptiPlex desk top running a chrome browser using home wi fi, will the chrome stick work? For Windows machines, the desktop sharing feature normally works well. But a few users Mari have audio or other issues. For media files, it’s better through chrome browser or plex media server. If desktop sharing is the only feature you are looking for, you’d better try to find other solutions. I’m using Win7 64bit and latest version of Google Chrome. I’m able to cast entire deskop screen to Chromecast very nice (it shows any/all applications running on Laptop Screen). But 1 or 2 particular Windows (e.g one is running commodity forward market, and another MS Office applications) are not cast at all and give non-connectivity error. Can you help? Needed email subscription to replies. That’s why I had to put this comment. There should be no issues to cast Microsoft Word or other programs. You can try to choose desktop screen instead of individual program window. New issue with screen mirroring that changed from one day to the next. do you want to cast. After choosing the window now I no longer get audio only video? Any thoughts or answers as to why there has been a change? It was literally from this past Thursday the 30th April to the 1st of May that this happened! For videos, you really should use other methods: Chrome browser, Videostream, Plex…. Google is still experimenting… But I think it is a good experiment. They added the capability of casting individual program/app window, not just the whole desktop. Well I want to cast the screen mostly because I am using XBMC or now Kodi as it is named. It worked great before this minor changed that happened recently. Not sure about the issue. You may find some apps to cast directly, instead of sharing desktop (which consumes considerable computer resources). You may also consider a Plex media server, then use the free Plex app (web or Android) to cast to Chromecast directly. yes, you can. Actually, now you have the option to cast whole desktop or individual program window. Cast the whole desktop is an old feature. But it is still marked as experimental (this is not uncommon for Google: they marked GMail as beta for many years). The major problem with desktop sharing is still audio, especially on Mac. 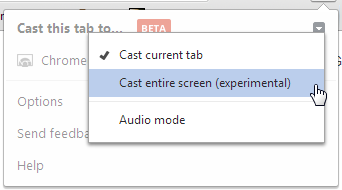 In late 2014, Google add the option to cast any individual program windows. 1. yes, desktop sharing may have audio issues. The solution is, for media files on your desktop, you can stream them with Chrome browser or a few other solutions discussed in this guide. 2. Chromecast can transmit sound for local media files. The audio problem only happens with desktop sharing. In your PC, you can use Chrome tab casting for local media files, which has no audio issues. You can also use Chrome extension,videostream, to stream local videos from your PC without any audio issues. If you have a large collection of video files, you can run free Plex media server on your PC and stream to Chromecast from PC or mobile devices. Just remember desktop sharing is only one of the many possible usages of Chromecast on desktop. And only desktop sharing has audio issues. Actually, I would not recommend desktop sharing for videos. There are many other better solutions for videos or music files. 1. Chromecast allow me remote my desktop can opening and typing, mouseover, copy and paste, opening all sort of Offices files or sending text/ files to friends on my desktop program etc to work right? So no audio is not a problem this part. 2. Now I want audio transmit for some media program such as PPS.tv (Asian steam TV program), Or some other steam Karaoke Apps that doesn’t work on a web browser, so in this case should I just cast the desktop for the screen and then buy something like wireless HDMI audio for the sounds to function ? For #1, your keyboard and mouse can only pair to the PC. So, if they are far from PC, you may not be able to use them. For display, there should not be an issue. Your TV can be just a duplicate of the program window or whole desktop. For #2, No, Chromecast will not work with HDMI wireless audios on PC as I know. But I never test it. You can try your luck to see whether you can get what you want with Chromecast. Occasionally, if PPS or other programs do not de-code in a standard way (e.g., use a very special DRM), Chromecast may fail to cast the video. My suggestion is you can check whether there is an Android version of such programs. As I know PPS used to have an Android app. With an Android App, you can cast screen (including sound) from Android devices to TV through Chromecast. The requirement is the Android device should have KitKat 4.4.2 or later (e.g.,Lollipop 5.0/5.1). I love the screen sharing, for it to be in beta it works good. However, could it ever be possible to use the Chromecast as a completely separate desktop where I could drag windows onto it and so on? No, desktop sharing can only mirror a window of a program or the whole desktop. I’m using a MacBook Air and while the screen casts the video image perfectly, the audio does not cast and still comes from the laptop speakers. I did notice that in the warning message, it only asked if I wanted to share the screen and didn’t mention anything about audio output. I’d appreciate any help you can offer! This is a known problem for some Mac users. There are no solutions for the audio issues yet. Thanks! My other laptop is running Ubuntu, and when I try casting the screen, it only casts the Chrome tab, even after I’ve launched another programme like Kodi. Linux is not officially supported for chromecast yet. Chromecast desktop sharing is mainly for Windows users. Mac users are facing more problems than Windows users. Resizing a window that you are casting may make your device unstable. If you are casting a chrome tab, you should stop casting first. If you are using multiple displays, try to set them as duplicate, not extended. Then try again. I have a mid 2012 macbook pro retina and when I try to share the desktop I just get a blank screen. Sharing a tab works ok and if I use Videocast or Videostream apps I can stream local media but just a blank screen on sharing entire desktop. I have also used the Beta version of Chromecast Ext. where you can change the bitrate and also the output resolution but no joy. Desktop sharing works best with Windows. For Mac, most people get audio issues, but not display issue. I can’t cast my desktop screen. I only can cast a tab. I even downloaded the Beta chrome cast app extension and still when I cast the screen (experimental) it casts only the tab. I have TV Live Streaming on another tab which does not have any Chrome Menu Buttons, so I can’t cast the tab there, and that’s why I am trying to cast the entire Desktop view from my Windows 7 Professional (I have the classic basic windows). When you choose to cast the desktop screen, it should ask you to choose individual window or whole desktop. Do you have problems with other windows or while desktop? Hi, Im interested in this item, but i need it mostly to cast my desktop, mirror monitor. I wanted to know if its still experimental, or its working properly for windows? I have read older post here and its says that it isn’t working so well. Desktop sharing is still experimental. It works on Windows quite well. Most problems are related to audio issues in Mac. Anyway, if this is primary usage, I would not recommend this. Is there any way to add caption (subtitles) using chrome browser to watch a video? it depends on video uploader. if CC is enabled, you should see a CC icon left to Settings (gear)icon. But if caption is not enabled, you will not see the icon. video is on .mkv format, I can see a CC icon when I am using other video players but using chrome browser. Is there any setting to enable caption capability? Probably no. Chrome browser is not designed as a full-fledged media player. did you try videostream app for Chromecast? It’s identical to Windows. You need install chrome browser, then install Google cast extension. I tryed this with a DVD movie playing on my PC (Windows 10), and we could cast the picture easy enough (though the quality was some what questionable, understandably). But the audio did not transfer to the TV, any suggestions? Desktop sharing is not intended for video playing. You can get better quality and performance using other methods. If you have a few DVD discs, you can convert them to mp4 format, then use chrome browser, videostream or Plex. There are many tools for the conversion. Vlc player even can do it. Handbrake is a good tool. Please note, the resolution of DVD usually is not good for morden TVs. Hi, I have installed Chromecast on my PC (windows) with no problems and been able to cast my PC desktop to our smart TV (Samsung). My PC is located in my home office and the smart TV is in our media room. My question: is there a way to use a mouse with the smart TV desktop cast? It is not good running between the two rooms just to select an icon on the PC desktop. If the distance between the two rooms is not too long, you can use wireless keyboard/mouse on the pc in front of the TV. Anyway, casting works in one way. You cannot control anything from the TV. You have to control it from pc or mobile devices. Thanks Simon, will purchase a wireless mouse and keyboard and give it a try. I am very impressed with the product. You can always download PC Remote http://pcremoteserver.com/ on your desktop and mobile device and then use your mobile device as a wireless keyboard and mouse. I have a chromecast audio. I use my PC to show movies on a videoprojector and would like to cast the audio to my stereo using chromecast. I tried casting the screen, but I’t won’t work. Any advise? You can cast audio to Chromecast audio only if you play the video on chrome browser. You just choose to cast current tab with video playing. Sharing desktop is for Chromecast, not Chromecast audio. It’s not recommended for videos. You will very likely get errors if you try to share desktop to Chromecast audio. So i have no issues with most streaming addons from my phone or laptop with the exception it seems while using the genesis Kodi add on, any suggestions on setting to change whether it be tv, laptop or just because its a beta product? and on an aside if i use an HDMI cable from laptop to tv for using genesis should that work equally well? yep on imac cannot get it to work – comes up with an error saying that resizing a window you are casting may make your device unstable – and when I click dismiss – doesn’t fix it – just reverts to the tab only view. Any other ways to do this? Want to cast VLC. Not sure. You can try to enable “mirror displays” in Extended Desktop. Although Chromecast does not use this setting, it may turn on some features required by Chromecast. BTW, desktop sharing works best ion Windows, not Mac. Some users also get audio issues on Mac. Try VLC for Android. it now supports Chromecast. You can stream all local media to Chromecast as shown in this guide. I haven’t read all the comments, so apologies if you’ve already answered this question. I was able to desktop share through Chromecast with no problems, audio and video come through fine (though with a split second delay from the computer). However, it’s annoying that my computer continues to play the audio; it is like listening to an echo. Any suggestions to disable (or at least minimise) audio on the computer while still transmitting it to the TV screen? This happens on some PCs. As I know, there are no solutions for it yet if your PC gets this problem. Desktop sharing is not recommended for videos. You can try to use chrome browser, or Plex Media server or videostream extension fit local media files. on macbook: didn’t work at first; all I saw was the warning that resizing the window may make the laptop unstable (which it does by the way). And also, there is a dismiss button, but clicking this doesn’t do anything. The trick is to select your chromecast device below the warning message, below the dismiss text. You do this after you’ve clicked the dropdown arrow menu from the chrome cast button mentioned in this tutorial. Mine was working fine to stream VLC and although I had the dual audio problem I just muted my laptop and it worked fine with audio on the tv. That being said, a week ago VLC no longer sent sound to the Chromecast 2 that I am using, sound is still fine with Youtube etc. Please advise if anyone has had this and has ideas of how to fix it. You can try to remove the Google cast extension, then add it again. Not sure. The audio issue is seldom reported on Windows. Audio is a bit complicated. On most Windows machines, audio should work. But on some Mac machines, it may not work. Hi Guys, worked fine for me, just one thing, is there anyway to stop the audio on the laptop and just have it on the TV? I use PLEX. Stopped the issues for me. I want to use amazon prime video using chromecast. but as soon as i open amazon prime video on my phone in chromecast , it opens up the app for playing the video. How should i open the video in the chromecast browser itself..
Amazon doesn’t like Google. Chromecast is actually blocked by Amazon video services. If you are on a PC, you can try to share the whole desktop. But the video quality will be quite bad. If you are using an Android phone or tablet, got can install Googe Home app, then try screen mirroring. Video quality will be slightly better. Desktop sharing works OK, but a bit lagging as expected. Sound quality is not very good, and there is some disturbance (small “clicks”) once every few seconds when using Tidal desktop app in Windows 10. This is normal. Desktop sharing is not intended for music or video. It is OK for static images/files or presentations.